All MLTs in Ontario were notified of the CMLTO’s 2019 Annual Registration Renewal requirements by letter mail in October 2018, and the online renewal platform became available on November 1, 2018. The opportunity to renew the CMLTO membership without penalty ended on December 31, 2018. Members who failed to renew by the deadline will receive a Notice of Intention to Suspend from the Registrar & CEO in the coming week. Members wishing to renew their membership can still do so until 11:59 pm EST, on Friday, February 8, 2019, at www.cmlto-onlineservices.com, however, late fees have now been added to renewal fees. All MLTs who have not renewed their membership by 11:59 pm EST on Friday, February 8, 2019, will have their certificate of registration suspended. If a member’s certificate of registration is suspended, the Registrar & CEO will notify the member and their employers by mail. Upon suspension, the certificate of registration expires, and the former member is no longer authorized to practise medical laboratory technology in Ontario. Further, a permanent notation of the suspension (and subsequent reinstatement, if applicable) will appear in the MLT’s record in the CMLTO Public Register. A list containing the names of all suspended medical laboratory technologists will be published in the FOCUS newsletter. Please note the CMLTO's holiday office hours in December and January. Click here (PDF) to learn more about each officer. CMLTO's Annual Registration Renewal for 2019 began November 1, 2018. All MLTs registered in Ontario must renew online by December 31, 2018, click on the red button above to get started. Review step-by-step renewal instructions by clicking here. If you have questions, please call 416-861-9605 and press 1 for Registration and Renewal, or email registration@cmlto.com. 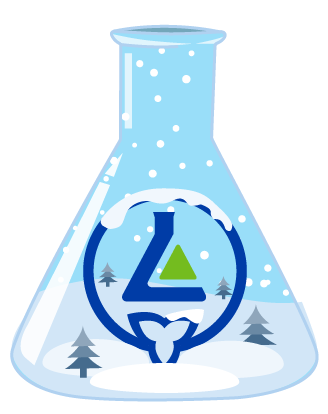 Please note that the CMLTO office will be closed on December 24th, 25th, 26th, and 31st. 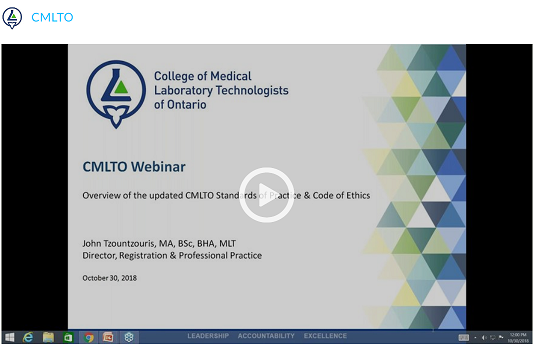 CMLTO hosted a webinar on Tuesday, October 30, 2018, during which staff explored various aspects of the updated Standards of Practice and Code of Ethics. The updated Standards of Practice and Code of Ethics come into effect on January 1, 2019. In case you missed it, a recording of the webinar is now available by clicking here. If you have any questions about the updated Standards of Practice and Code of Ethics, please contact the CMLTO at memberrelations@cmlto.com. CMLTO members are reminded that they must renew online by December 31, 2018. Click the red button to get started. For more information about the renewal process, click here. Due to recent Canada Post labour actions in Ontario, CMLTO members may not have yet received their registration renewal notices by postal mail. Please note that it is still members’ responsibility to renew online between November 1st and December 31st. The CMLTO will continue to monitor the postal delivery situation and may also send renewal notices by email. Members who have questions about the renewal process should contact registration@cmlto.com for assistance. This summer, CMLTO conducted its first ever online elections for Council member positions in Districts 1 and 3. There were two candidates running in each election. Congratulations to Josh Lewis and Chee-Yuen (Helen) Meaney who will begin their three-year terms on Council on January 1, 2019. On behalf of the CMLTO and the membership, Registrar & CEO Kathy Wilkie thanks all of the candidates for taking the time to stand for election and for their willingness to engage in the self-regulation of the profession to protect the people of Ontario.